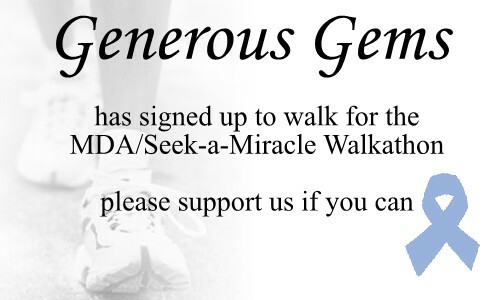 Generous Gems proudly participates in this Annual Event, and will collect donations via our site until the walk in hopes of raising additional funds. Every $1 helps. Friedreich's ataxia is an inherited disease that causes progressive damage to the nervous system resulting in symptoms ranging from gait disturbance and speech problems to heart disease. It is named after the physician Nicholaus Friedreich, who first described the condition in the 1860s. "Ataxia," which refers to coordination problems such as clumsy or awkward movements and unsteadiness, occurs in many different diseases and conditions. The ataxia of Friedreich's ataxia results from the degeneration of nerve tissue in the spinal cord and of nerves that control muscle movement in the arms and legs. The spinal cord becomes thinner and nerve cells lose some of their myelin sheath — the insular covering on all nerve cells that helps conduct nerve impulses. Generous Gems is helping to raise awareness and fight FA. You may click the image above to make a small donation, every dollar helps. Please note, all donations made through our donor page will go to FA Awareness.